Like the directors of this documentary, I am a passionate fan of cricket, and of the highest form of the game, Test Match cricket. Like them I have watched in horror the rise of the more explosive T20 form of the game, and how it has shortened the patience of audiences and players alike. I have also watched with horror as the power in world cricket has shifted toward the country with the largest and most passionate fanbase and the most corrupt culture of corporate governance - India - and how that power has been used to shore up the influence of the big three nations - India, England and Australia - at the expense of the smaller and less wealthy playing nations. For example, the cricket world cup is the only world tournament where qualifying places are carved up among the big boys. In football, for example, San Marino qualifies in the same way as Brazil. Free market forces ensure the best teams get through. But in many ways, I have felt that this was merely cricket growing up. Football has long been run by a corrupt oligarchy with Sepp Blatter at its head. The IOC has long been mired in allegations of corruption. Where there are large sums of advertising and sponsorship revenue there is going to be powerful men vying for control and divvying up the spoils. Why should be cricket be different? The answer goes, for Romantics, that cricket is different. It isn't so much a sport as a code of ethics and an approach to life. It is synonymous with fairplay and gentlemanly conduct. One walks from the playing field when one is out, rather than waiting for the Umpire to signal it. I delight in such whimsical nonsense myself. But in doing so I fly in the face of the facts. Cricket may clothe itself in gentlemanly attire, but ever since the Bodyline tour in the 1920s, and the Apartheid tours in the early 1980s, and the corruption of Hansie Cronje in and Mike Atherton ball tampering in the 1990s and Stuart Broad not walking and spot fixing in the IPL and even county cricket in the 2000s.... Well you get the picture. Cricket is a sport played and administered by mere mortals and as such is as susceptible to corruption and power plays as the next sport. And as much as I would love to see test match cricket preserved, it's akin to my wanting to see schoolchildren taught latin and teenagers value their online privacy. These are laments from another millennium. 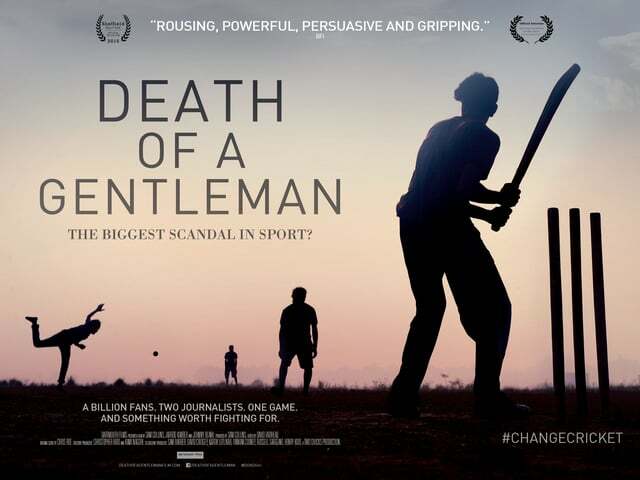 The bizarre notion at the centre of this new documentary is that all of this disaffection with the administration of cricket is somehow news or somehow peculiar to cricket. Asking if the Big Three Takeover, as it's sometimes called, is the biggest scandal in sport is simply hyperbole, especially at a time when Sepp Blatter has been forced out of FIFA. We all know IPL is corrupt and that the BCCI has ruthlessly used its power to punish smaller boards. What does this film add? Well not much. We all know the current head of the ICC and ex head of the BCCI is dodgy. His IPL team was kicked out of the tournament for corruption and he gave the head of the Indian cricket team a cushy job in his company. But by relying on his nemesis Lalit Modi - a man who is similarly dodgy - the film undermines its own credibility. Or going to crash an ICC meeting with a "fake sheikh". That just looks foolish. The problem for the film-makers is that no-one will talk on camera because they are worried about upsetting the cricket administrators for whom they rely for press accreditation and interviews. And this to me is the scandal in global cricket. I have no problem with businessmen fighting each other for unpaid jobs that actually carry with them massive potential for power and money and putting their country's interests first. I wish they would altruistically but I'm not naive. This is what happens when money enters the game. But I DO have a problem with journalists who don't report on this stuff because that IS their job. And that's why I similarly hate the move in global cricket from proper journalists covering the game to ex players. Ex players are there to talk about tactics and be big personalities. Journalists are there to hold people to account. So, take for example, Jonathan Agnew, of the BBC. Funded by the license fee he is there to ask tough questions. All the questions these documentarians try to ask he should be asking with the full weight of the BBC behind him? Why isn't that happening? So this documentary is heartfelt and earnest but it isn't ground breaking in its revelations nor does it deliver the silver bullet it hopes for. Fans of cricket will find little new and people unacquainted with the game will be uninterested. The scandal in world sport is that giant corporations are run with little governance and oversight. Cricket is just one of many to suffer from this problem. DEATH OF A GENTLEMAN has a running time of 99 minutes and is currently on very limited release in the UK.